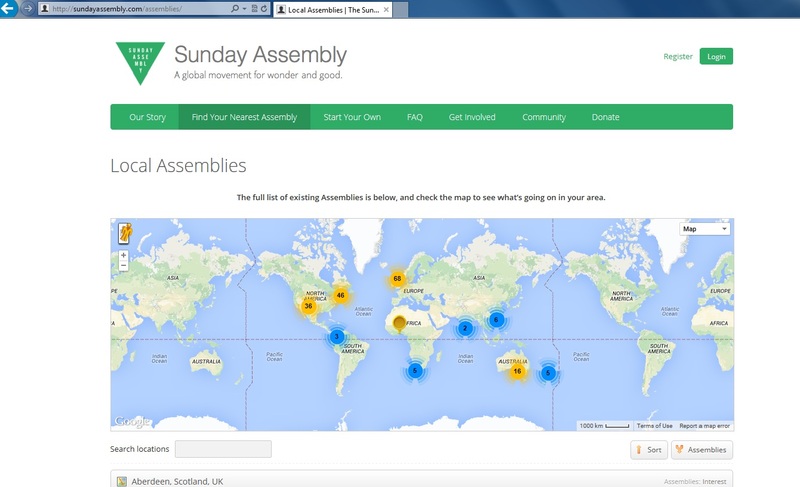 In this post, Yutaka Osakabe and Isaac Gagné explore what we can learn from the absence of the Sunday Assembly [SA] in Japan, despite some interest in setting it up. What can a lack of interest in a Japanese SA tell us about the SA framework and/or the Japanese relationship to organised religion? God-less congregations, also known as members of the Sunday Assembly (SA), have been a recurring topic on this blog. Discussions around the SA have raised a number of meaningful questions over any strict distinction between religion and non-religion. This post, however, takes a slightly different approach, by exploring what difficulties the SA might face when they attempt to expand their movement outside the post-Christendom west. How do the SA attempt to address any challenges they face during expansion and indeed if they are interested in overcoming such difficulties? These questions follow an attempt to participate in a launch event for SA in Japan. As it turned out, the launch was a ‘non-event’. In the face of the usual positive, success story of the SA this ‘non-event’ seemed to offer the possibility of reflection on failure, and some raised new questions about the SA. On the 28th of September, the SA attempted to hold a launching event all over the world, and Tokyo was one of the venues. Initially, Yutaka was curious about what kind of people would participate in this event and how these people react to the new style of gathering. In an earlier NSRN post, Katie Aston points towards the SA’s choice to style the services on a Church model, rather than creating a new one, since this fosters a recognisable space for participants. The question was, would the SA introduce their vision in Japan in a similar Anglican style or if they would adapt it to something more recognisable in a setting without a Christian tradition? In her post, Aston also refers to fellow researcher Lorna Mumford’s reflections that the Christian idiom may be recognisable, but only to a select population. Yutaka, therefore, to investigate these issues and was happily introduced to Isaac Gagne, who was working in the field of cultural anthropology in Japan and shared similar curiosity with me. He took over the mission from there. A description of the process is necessary to appreciate Isaac’s endeavor. Isaac signed up for the event two months before and received his “free ticket”. However, he noticed that the ticket listed the location as “Tokyo, Tokyo” without any precise address. He emailed the “organiser” through the ticket website twice, from two different email addresses, and received no response. He then found another address embedded in the automatic ticket confirmation email address. He emailed this address and received an automatic reply in Dutch saying: “This address is not checked often, so please contact me at my private address”. There was no name and no private address included in the e-mail; therefore, he was not able to contact anyone to inquire about the event, nor find out if the event actually did take place in the end. We came to conclude that it did not in fact take place at all (although we would be interested to hear if this is incorrect). In the remainder of this post we come together to think about “why it did not happen”. Investigating absence is probably more complicated than the opposite. Thus, this report is no more than exploration of some possible factors supported by rather general observation of Japanese culture. First of all, the fundamental nature of SA as an anti-institutional-agency might be difficult to find sympathy with in Japan. Andrew Brown discovered that many participants in the SA in central London are ex-Christians. They are usually turning away from the religious backgrounds that they were raised in, or else they are choosing SA events in opposition or merely in contrast to other more religious practices which permeate the social contexts in which they live or were raised in. In contrast, such “religious alterity politics” is absent, or limited in a more moderate expression, in Japan. Even the traditional Buddhist or Shinto sects tend to stay away from political issues, at least publicly. Their influence has remained in people’s everyday life, such as handling funerals and weddings or running certain social services. Secondly, the fact that the SA involves collective actions (or assemblies) might be a challenge for Japanese people in general. This is partially because mainstream Japanese religions, whether Buddhism or Shinto (with the exception of certain new religions), do not usually provide a place or occasion for collective meetings. Therefore, such activity is considered as unusual in the first place. Furthermore, unlike western countries, Sunday is not associated with any kind of religious-like community gathering in general. Moreover, the SA’s style of ritual is unfamiliar to Japanese people. Performances by bands, singing, sharing stories, or fellowship might not be unfamiliar for many Japanese if they are done separately in their respective contexts, but doing them altogether might sound strange and perhaps uncomfortable. Ironically, comparison with the Japanese context helps bring our attention to how the SA is operated within a western (or Christian) framework both in motivation and style. In Shusaku Endo’s novel Silence, a Jesuit missionary, who was sent to 17th century Japan, described Japan as a “mud swamp”, to express the difficulties he faced as a missionary. Here, Christianity seemed to grow but died soon after because the wet ground putrefied the roots. If ministers uttered similar laments about Japan today, it would not be surprising. The question remains if the SA will have to face similar challenges in their attempts to expand their group in a country such as Japan where there is no shared framework with their mission. Just like Christian missionaries today, does the SA have to struggle with contextualising their own ideology? If so, what kind of commitment will drive them to enter into the arduous task of cultivating such a swamp? Or perhaps, are they not interested in sowing their seeds in such a country if they require ploughing the swamp because it might be considered as very Christian things to do? Lastly but not least, the SA might have to put much effort to overcome the legacy of the Aum Affair in the 90s where the members of Aum Shinrikyo released deadly poisons on the five trains during the morning rush hours in Tokyo underground system, injuring thousands of people. This incident increased negative feeling towards religion. This was exacerbated by the mass media’s constant coverage, which portrayed the Aum as a dangerous and mind controlling cults as a whole (Watanabe, Ch.4). Of course, the SA would eschew any similarities made between themselves and such extreme organisations. However, one of their characteristics of a “non-institutionalised gathering”, which attracts some ex-Christians members, may trigger some negative reactions. In this sense, the advertisement itself could be a great obstacle. The style and propaganda will still be perceived very much as simply imported or borrowed ideology. The gathering style will not easily be accepted, but the propaganda, which is initially meant to challenge the institutionalised religion, may also make some Japanese people uncomfortable. After all, the SA cannot avoid its association with Western (Christian) traditions. The SA thus seems to be stuck with a difficult situation here when they attempt to recruit more people within the non-western countries. In her post, Aston poses some overreaching questions: “Do atheists need a community? Shared practices? A space to commune?” We could also ask “How will they conduct their mission? Will they care to overcome some cultural boundaries? Will they eventually compromise their style and message in order to gain further popularity outside of their initial success in Anglophone settings? How will they differentiate their answers to these questions from the ones Christian missionaries have had for centuries?” At this moment, according to their own website, Malaysia and Singapore have been given a status of “startup” within Asia, but other countries, such as China, India, Hong Kong, Japan and Philippines are simply labelled as “of interest”. So the ultimate question is taken over from Aston – where next for the SA? Isaac Gagné is a Research Associate at the Waseda University Institute of Asia-Pacific Studies. He received his Ph.D. in sociocultural anthropology from Yale University. His research focuses on the dynamics and meanings of ideologies and identity politics of gender, subculture, religion, and morality in contemporary Japan. Yutaka Osakabe is a PhD candidate at University of Aberdeen. He is interested in the encounter between religion and the secular and how it challenges the way each group enters into politics. Based on this interest, his PhD thesis explores how Christian groups in the UK formulate, legitimise and promote religious ideas of justice as a way of resolving criminal justice issues in society. This entry was posted in NSRN Blog, Uncategorized. Bookmark the permalink.